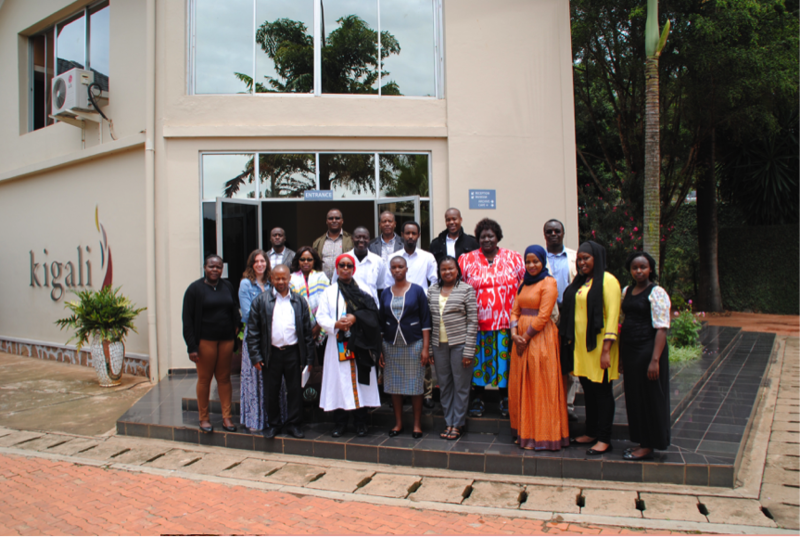 The Auschwitz Institute, in collaboration with the Kenyan National Committee (KNC) for the Prevention of Genocide, held a Benchmarking Meeting and Retreat in Kigali, Rwanda on March 19-24, 2017. The primary goal of the program was to learn from the experiences of Rwandan civil society and government actors about methods for memorializing past atrocities. The KNC has decided to establish a “Never Again” Memorial to commemorate various forms of mass violence that have occurred in Kenya, in particular the violence following the 2007-2008 elections. The goal of this memorial is to prevent the recurrence of atrocities and to promote peaceful resolution of conflicts in the country. KNC members toured three memorial sites in different regions of Rwanda: the Kigali Genocide Memorial Center, Murambi Genocide Memorial Centre, and Ntarama Genocide Memorial. During the subsequent meeting, the KNC benefitted from two presentations concerning genocide prevention, reconciliation, and memorization in Rwanda. Mr. Johnson Mugaga from the National Unity & Reconciliation Commission (NURC) spoke first and discussed the Rwandan model for peace and reconciliation and the work of the NURC with the attendees. Following Mr. Mugaga, Dr. Jean-Damascene Gasanabo, Director of General Research at the National Commission for the Fight Against Genocide (NCLG), spoke about the work of his organization in coordinating the Annual National Week of Mourning (April 7-13), managing genocide memorial sites, and delivering public lectures for villages, schools, and government institutions. By the conclusion of the retreat and benchmarking meeting, the KNC had developed several resolutions, including a strategic plan for the Never Again Memorial in Kenya. The KNC also established guidelines for the memorial that will ensure public participation, inclusivity, local ownership, and uniformity in narrative, among others.